In October of 2015, I fell apart. I had dealt with mild depression in the past, but nothing prepared me for the depressive episode I experienced that Fall. I lost the ability to function and felt stuck in a spiral that I couldn’t get out of. I began therapy and after several failed attempts to find a medicine that worked for me, I found myself in an intensive outpatient program at Ridgeview Institute in Atlanta. I took a break from performing music that I feared would become permanent and struggled to get through my classes at Kennesaw State University. Over time, I began to get on my feet again with the support of friends and family, and I started to pursue a new interest in yoga and meditation. After reading Jon Kabat Zinn’s Full Catastrophe Living, I took a life changing 8-week course in Mindfulness Based Stress Reduction at the Atlanta Mindfulness Institute. I knew I needed to find a new path forward if I was going to continue working as a musician. For too long I had let music define me, and I let the pressures of life as a musician overwhelm me. A 2016 house concert of original music with my quartet was a turning point. Even though I had debated canceling it many times, it was healing to make music with close friends in front of a supportive audience. By the end of that year, I began talking with vocalist Laura Coyle about starting a new duo project together. We each welcomed the idea of having a partner to share the business side of music with, freeing up more time for creative collaboration. In 2018, drummer and producer Marlon Patton approached me about documenting the songs that I had written during this tumultuous period. Begin Again features many of the groups and musicians that I have worked with over my career including the Trey Wright Trio, the Hibbard/Wright Project, Squat, and Laura Coyle. It was particularly meaningful to pay tribute to Carl Lindberg by recording his song “Looking at Each Other” with Squat members Darren Stanley, Kevin Hyde, and Tommy Somerville. This music is not meant to be sad. In many ways, it is quite the opposite. For me, it is life affirming. The songs “Begin Again” and “May You Be Free” were inspired by my readings and exploration of mindfulness and the song “Me and Einstein” is dedicated to my many adventures with my nine year old son Timothy. I am forever thankful for the friends and family that stuck by my side during this period (you know who you are!). I hope you enjoy the music on this record. For me, it is cathartic and a reminder that you can always begin again. Itunes Preorder for Begin Again! Itunes Preorder for Trey Wright's upcoming Blue Canoe Release ​Begin Again! Preorder your copy now ! New Blue Canoe Records release Begin Again! 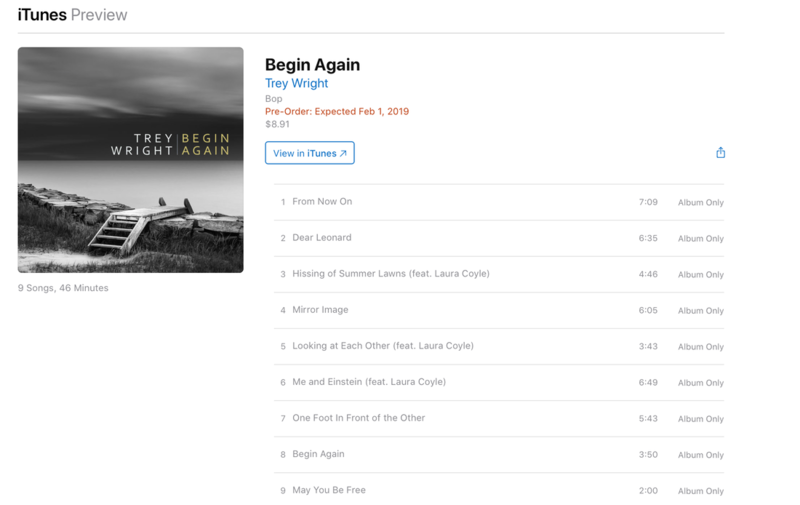 ​New CD Begin Again to be released on Blue Canoe Records on 2/1/2019! - Click here to order your advance copy starting 1/14! Upcoming CD release features 7 original compositions plus renditions of bassist Carl Lindberg's "Looking at Each Other" and Joni Mitchell's "The Hissing of Summer Lawns". For this latest CD, guitarist and composer Trey Wright is joined by vocalist Laura Coyle, saxophonists Mace Hibbard and Sam Skelton, trombonist Kevin Hyde, bassist Marc Miller, drummer and co-producer Marlon Patton, pianist Tommy Somerville and percussionist Darren Stanley. Trey Wright Artist's Picks Spotify Compilation! In anticipation of the upcoming release of Begin Again on 2/1/19 on Blue Canoe Records, I have created a compilation playlist on Spotify of past recordings including selections from Squat, the Randy Hoexter Group, the Hibbard/Wright Project and my releases Where I'm Calling From, Thinking Out Loud and Songs From Oak Avenue. Play the tracks on the widget to the left, or click on the button below to access the playlist on Spotify.